Alcohol Archives - Seven Countries Study | The first study to relate diet with cardiovascular disease. A Mediterranean style diet, a high level of physical activity, not smoking and moderate alcohol consumption were all associated with low 10-year risk of CHD and CVD in the European HALE project. A very low risk of these diseases was observed in elderly men who had four compared to those who had none or one healthful diet and lifestyle factor. We estimate that among elderly men who did not adhere to a low-risk lifestyle pattern, 64% of deaths due to CHD and 61% due to CVD might have been prevented based on the observed risk differences. Among elderly men, the more healthful factors of diet and lifestyle the lower the CVD mortality observed. More than 60% of CVD mortality was associated with lack of adherence to the low-risk pattern. This finding implies that even at advanced ages those who follow a Mediterranean style diet and maintain a healthful lifestyle are less likely to die from CVD. At least mild physical activities (2 kcal/kg/hour, so f.i. for a 70 kg person that would be 140 kcal/hour) were inversely related to depressive symptoms in the baseline survey of the Finland, Italy, Netherlands Elderly study. One unit of moderate physical activity (30 min per day of walking, cycling, gardening and sports) at baseline was associated with a 3% lower risk of depressive symptoms 5 years later. 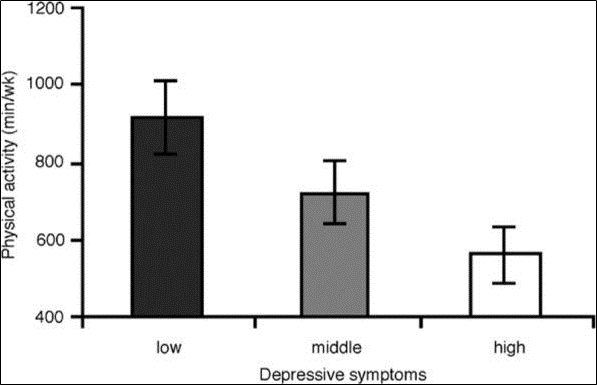 Moderate alcohol intake (less than 31 gram per day, equal to 3 glasses/d) entry was related to a 65% lower risk of depressive symptoms 5 years later, but the prevalence of smoking did not predict depressive symptoms. In elderly men of the FINE study, moderate coffee drinking was associated with less cognitive decline, while alcohol consumption and tobacco-smoking were not related to cognition. 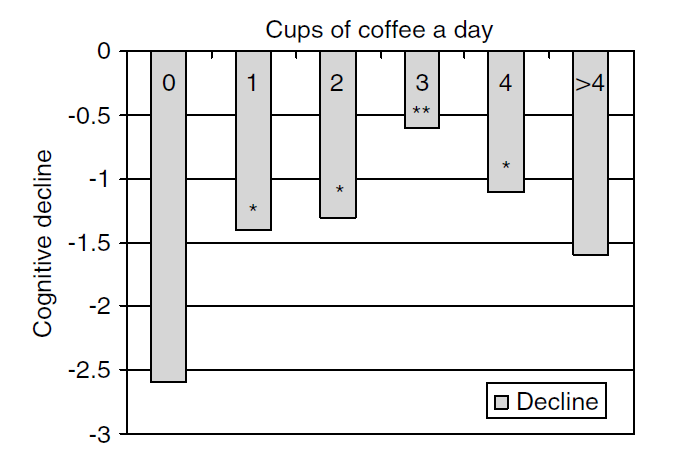 The least cognitive decline was observed for elderly men who consumed 3 cups of coffee/day. It was 4 times less than the decline among non-consumers. The association between coffee consumption and cognitive decline over a 10-year period was investigated in the FINE study. In Finland, 90% of the elderly men drank coffee, while 95% did so in The Netherlands and 50% in Italy. Alcohol consumption was not related to cognitive decline in men without CVD or diabetes at entry. About 80% of the elderly men in Zutphen used alcohol while only 5% drank as many as 3 drinks per day. There was also no association between cigarette smoking and cognitive decline in men without CVD or diabetes at entry. In Zutphen, only 23% of men aged 70-89 smoked cigarettes. The risk factors – smoking, serum cholesterol, blood pressure, lung function and the presence of CVD at baseline – were associated with death from dementia. The risk was 58% greater for heavy compared to non-smokers, 55% greater for hypertensives compared to those with normal blood pressure, 73% greater for those with a high level of serum cholesterol, 46% lower for those with a high compared to a low lung function and 94% greater for those with a history of CVD at baseline compared to those with no such history. Men with a combination of two of the risk factors had a 2 times greater risk of death from dementia. These results suggest that that cardiovascular risk factors measured in midlife predict the risk of death with dementia. Cardiovascular risk factors were measured at baseline and 160 out of 10,211 middle-aged men died from dementia during 40 years of follow-up. The results of the SCS suggest that cardiovascular risk factors affect the neurodegenerative process leading to dementia. Wine drinkers in Zutphen who at entry of the study consumed less than 20 g alcohol from wine per day – the equivalent of 2 glasses – had a 39% lower risk of coronary death and a 32% lower risk of overall cardiovascular mortality. Consumption of beer and spirits was related neither to long-term coronary or cardiovascular mortality. These results are compatible with the idea, but do not establish, that a low intake of wine may protect against CVD. In the Zutphen Study information on alcoholic drinks consumed was collected by questionnaire seven times between 1960 and 2000. 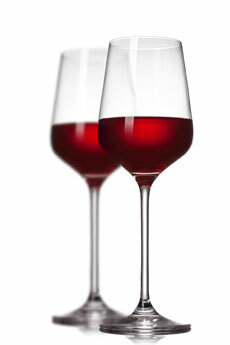 Regular wine consumption increased from 2% of the men to 40%. Of the wine consumed, 70% was red. The percentage of beer drinkers was approximately 40% in the period 1960-1970 and fell to about 25% in the period 1985-2000. The percentage of men drinking spirits increased from 15% in 1960 to 55% in 1985 and did not change thereafter. In the rural Italian cohorts and in Zutphen information on alcohol consumption was collected with the cross-check dietary history method among all men. In the 1960s the average alcohol intake in the rural Italian cohorts was more than 80 g/day, while less than 10 g/day in the Zutphen cohort. 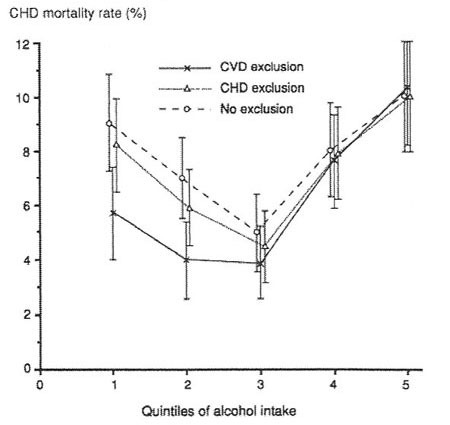 In rural Italian and in Zutphen men a J-shaped relation was observed between alcohol intake at entry and CHD mortality. 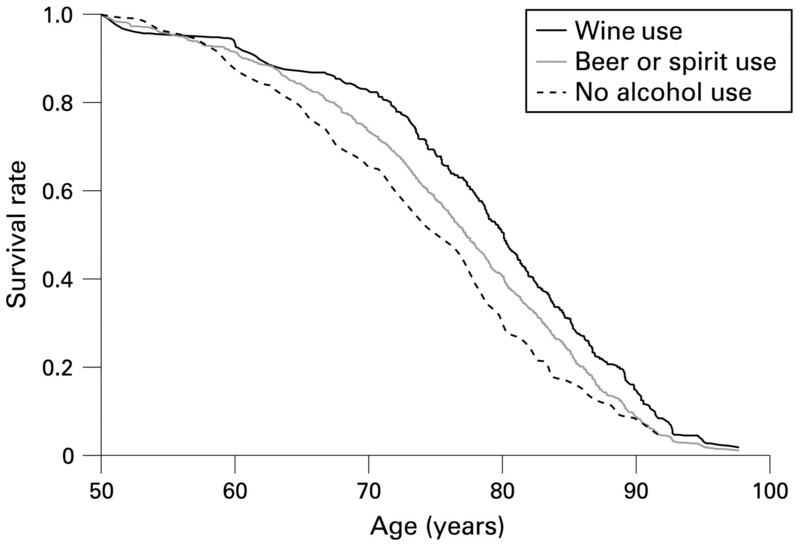 In Italian men the lowest 15-year CHD risk was observed in the mid-range (third quintile) of alcohol intake. A 30% lower CHD risk among alcohol users compared to non-users was found throughout the range of use up to 80 g per day. Zutphen men using less than 20 g per day, compared to non-users, had 30% lower CVD mortality during 40 years of follow-up. Above 20g/day the CVD risk was greater. These results are compatible with a protective effect of alcohol for CHD risk in Italy and CVD risk in The Netherlands in the low range of 1-20 g/day intake. The Italian data showed that the possible protective effect of alcohol on CHD keeps until very high levels of alcohol intake. Also other studies in Mediterranean areas reported a higher protective effect of alcohol than countries outside the Mediterranean. This may be due to differences in consumption pattern. Northern European men used mainly beer and spirits outside meals and men in Mediterranean areas consumed mostly wine with meals.